Markets like Crossroads support immigrant farmers by connecting them with other immigrants, making it easy to exchange knowledge, and helping them find a way to return to their agrarian roots. The Crossroads farmers’ market is known statewide for being the first farmers market in Maryland to electronically accept various types of nutrition benefit programs: food stamps, known federally as Supplemental Nutrition Assistance Program (SNAP); Women, Infants, and Children (WIC); as well as senior food assistance vouchers. Dudley explains that the market committed to accept electronic food stamps after paper vouchers disappeared in the late 1990s. Although there is a growing population of Latino and Hispanic farmers in the United States, they often struggle with linguistic, cultural, and legal barriers. According to the Agricultural Census of 2007, Hispanic farmers are the fastest-growing population of new farmers and grew 14 percent from 2002, as compared with a 7 percent overall increase in farm operators. 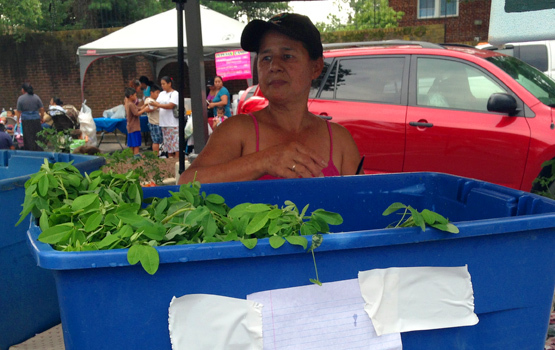 via Market Offers Wealth of Tradition—and Veggies—for Immigrant Farmers and Shoppers by Sarah Meade and Laura-Anne Minkoff-Zern — YES! Magazine.